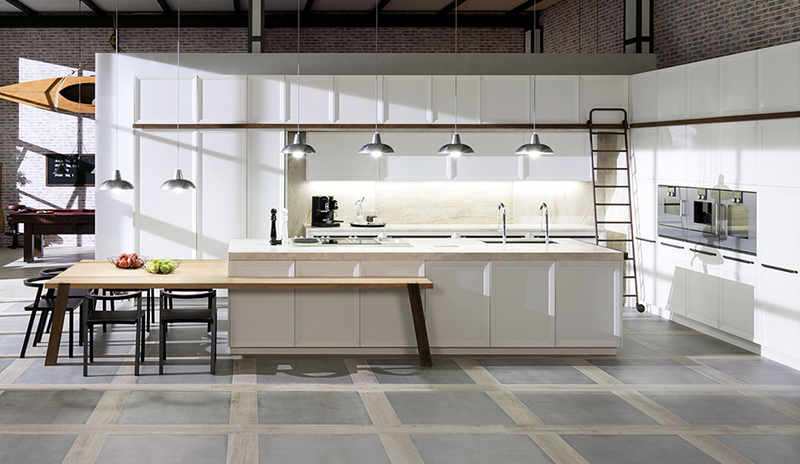 Home | News | What’s Cooking in Contemporary Kitchens? What’s Cooking in Contemporary Kitchens? We know there are a lot of decisions that must be made when revitalizing a kitchen. The beauty of creating a contemporary kitchen is that it offers a simple, minimalist look often defined by a black-and-white or a two-toned color scheme. Contemporary kitchens feel welcoming as they typically offer an uncluttered but often elegant look while sometimes borrowing elements from other designs; such as a vintage table in the dining area. 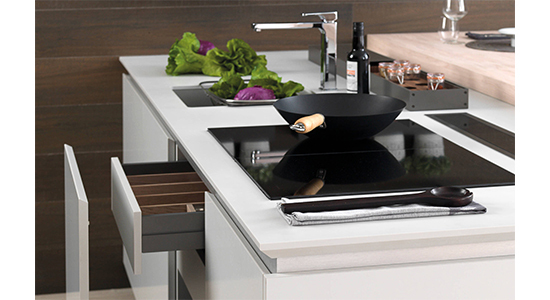 Sleek white cabinetry against black porcelain flooring, all-white or all-black kitchens are alluring. Incorporating traditional and practical elements will offset the simple color pattern. A contemporary look avoids excessive colors or textures and by incorporating the latest design techniques, it’s a snap to tuck gadgets out of sight with practical, yet beautiful, accents. Kitchen cabinets have evolved and stunning designs are available which further streamline the contemporary kitchen and transform the entire room. Porcelanosa offers cabinet door styles that avoid decorative accents, crown molding or raised panels and instead boast features that include flat or integrated handles, recessed panels or shaker doors with aluminum or integrated handles. These flat and flush kitchen cabinet styles are sleek and meek with simple hardware on the drawers and doors which open and close with a ghost-like whisper. Contemporary cabinetry is also ideal to use in small or tight spaces as the lack of adornment or molding allows for taller cabinets which means increased storage. Shaker-style cabinets mirror the original cabinets designed by the Shakers who were skilled craftspeople. Cabinets have recessed panels and minimal adornments and are complemented with a natural finish or a light stain. Shaker cabinets are an ideal addition to a contemporary kitchen given their minimalist features. Wouldn’t you agree that more time is spent at the kitchen table of kitchen countertop than anywhere else in the kitchen? Not only will choosing a KRION® or XTone countertop ensure a long-lasting, durable and beautiful surface, either option will increase a home’s value due to the extensive list of benefits both of these superior products offer. 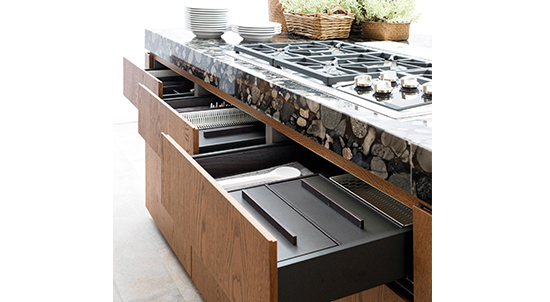 You’ll want to cozy up to snacks on an XTone or KRION® countertop. An extensive line of kitchen faucets and hardware are available in a variety of shapes, styles and price points, all designed to offer simplistic and symmetrical lines which complement a contemporary kitchen. Customization features include pull-out hoses, side sprayers and swivel spouts. 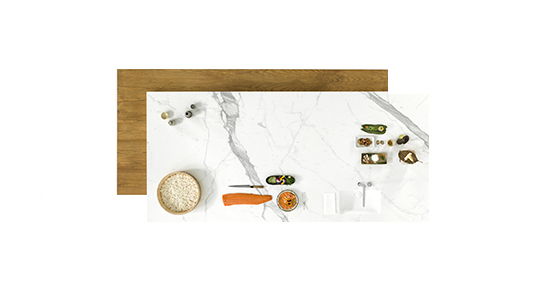 Porcelanosa also designs unique storage for cutlery, knives, utensils and soap to ensure an uncluttered look in the kitchen. While we agree that high-end flooring reigns supreme in every kitchen, we also know that the many small accouterments that make working in a kitchen easier are a home cook’s best friend.